Bonhams to auction rare limited series George Daniels wristwatch. 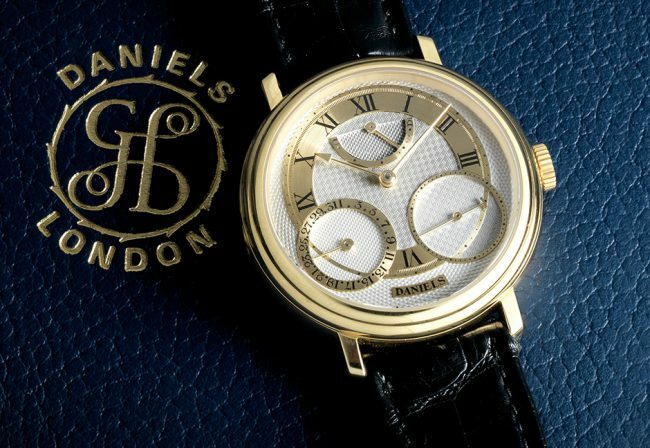 SalonQP.com features a George Daniels watch coming up for Auction at Bonhams. Daniels, is widely regarded as one of the greatest watchmakers to have ever lived. Self-taught, he established the ‘Daniels Method’ by becoming the first person to have mastered 32 of the 34 skills necessary to craft a watch entirely by hand. Not only did Daniels attain this zen-like mastery of his craft through trial and error, he also invented an entirely new type of escapement, the Co-axial, which Omega eventually purchased and placed at the heart of its watchmaking activities. Coming to the craft late in life – Daniels completed his first watch in 1969 as he approached the age of 50 – he completed just 27 unique pocket and wrist watches, as well as the Millennium and Anniversary series runs of 58 and 35 pieces respectively. 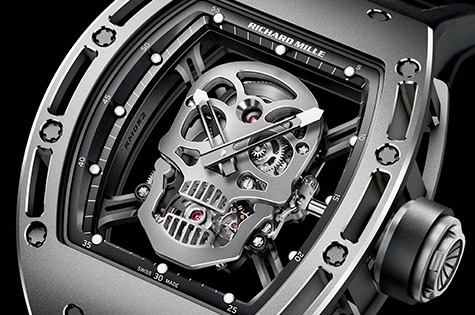 The Millennium series celebrated the Swiss watch industry’s acceptance of the Co-axial movement. These watches Daniels crafted with his protégé, Roger W Smith, using the very first Omega Co-axial movements in 1998. Bonhams New Bond Street London.W.1. 19th September 2016 LOT 563Y. Daniels anniversary edition. The Robert White Collection. 18K. LTD SERIES. No.24/35. Manual wind. Instantaneous calendar. power reserve indication. Co-Axial escapement & start crop mechanism. Courtesy and with thanks MagazineQP. www.SalonQP.com and Bonhams Auctions. Jerry Hall in Vogue in 1975. Jerry Hall photographed for Vogue 1975 by Norman Parkinson courtesy art net Auctions.The Skinny is a series that explores artworks of note currently offered on artnet Auctions. Here, we take a look at a work in the “Style and Glamour” sale—by Norman Parkinson, —that offer a unique, intimate view of American style icons. All the photos were produced by photographers who had close friendships with their subjects, and thus, their lenses often caught these famous women in moments another photographer would otherwise not have been able to capture. Photo syled by Grace Coddington. 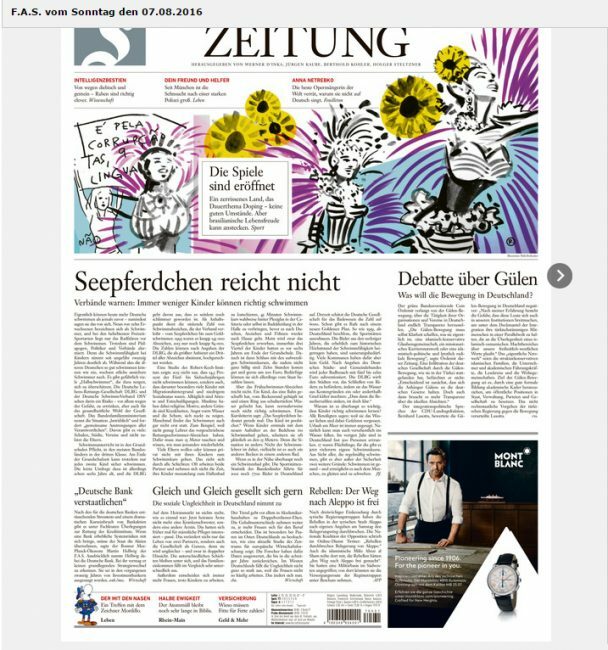 Courtesy & with thanks Frankfurter Allgemeine Zeitung Sonntag & Thilo Rothacker. A tradition going back over half a century, the Pebble Beach Concours d’Elegance is where the world’s collector cars meet and compete. Only the 200 best collector cars in the world roll onto the legendary 18th fairway of Pebble Beach Golf Links, and only a handful of those will receive official recognition for style, technical merit and historical accuracy. But the Concours is only the final event in a packed week celebrating the classic automobile! 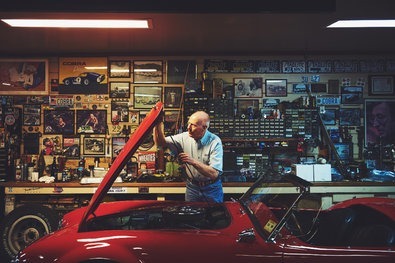 All over Monterey County, classic cars take to streets, golf courses, parks and the world-renowned Mazda Raceway Laguna Seca, surrounding visitors with automobiles from yesteryear. AC Cobra were originally built by AC Cars in Surrey, England, in the 1960’s. A team of US modified Daytona Cobras, sheathed in aerodynamic coupe bodies, defeated the Ferrari team for the 1965 World Sportscar Championship, a 20-race series held at various venues in the United States and Europe. By ROBERT C. YEAGER JULY 28, 2016. International New York Times. HE had hired five vintage auto inspectors to pore over every inch of the gleaming red roadster. But Evan Metropoulos, a collector, had never actually laid eyes on the car until this moment. Now, as the garage door swung open in Beverly Hills, Calif., he held his breath. “I couldn’t believe it was real,” Mr. Metropoulos recalls of that day in 2009 when he first saw the Shelby Cobra he had bought from its third owner for $1.3 million. Indeed, except for long-ago viewings at some Ford dealers, and brief glimpses on the road when it was new, the car has remained mostly unseen since it was first bought in Laurinburg, N.C., in 1968. The Cobra, a 427 model, will make a rare appearance when it joins a “postwar preservation” class next month at the Pebble Beach Concours d’Elegance, in Carmel, Calif. Conceived by Carroll Hall Shelby, a former Texas chicken farmer who became a prominent international race driver of the 1950s, Cobras were based on the British-built AC Ace Roadster. While retaining that car’s widely admired overall design, Mr. Shelby modified the vehicle to accept Ford Motor’s new V8 engines, which offered greater reliability and a significant step-up in power from AC’s straight sixes. The Cobras were built by AC Cars in Surrey, England, then shipped to Mr. Shelby’s shop in Southern California for final assembly. Besides victorious campaigns on racing circuits in the United States, a team of Daytona Cobras, sheathed in aerodynamic coupe bodies, defeated the Ferrari team for the 1965 World Sportscar Championship, a 20-race series held at various venues in the United States and Europe. Mr. Metropoulos says his car, assembled in 1967, was among the last 50 of the fewer than 1,000 Cobras produced in the 1960s. Production stopped in 1968, but the Cobra went on to become one of the most replicated cars, with copies of varying quality made by numerous manufacturers. Until his death in 2012, Mr. Shelby periodically issued “continuation” and commemorative Cobras. 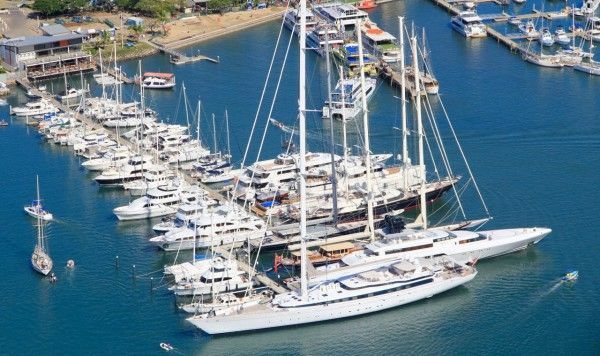 On 5 August the Fijian yachting industry and a collection of New Zealand’s marine companies will jointly host an open day at Port Denarau Marine and Yacht Club, Fiji, to engage with super yachts and their crew. “Working cooperatively with the Fijian yacht industry makes sense to us,” comments Peter Busfield, executive director of NZMarine. Presentations will focus on New Zealand’s well established refit and maintenance sectors, as well as showcasing its destinations and marinas. Superyachts and their crew will have the opportunity to engage with representatives from 25 of New Zealand’s marine companies. With superyachts requiring periodic refits, New Zealand provides the ideal location for yachts cruising the Pacific Isles to escape the Pacific cyclone season, tend to maintenance works and cruise New Zealand and Australia before returning to Fiji, Tahiti and other Pacific Isles. The open day will feature seminars on passage planning between Fiji and New Zealand, weather patterns, customs clearance and biosecurity requirements. The New Zealand customs authority has recently introduced a 24-month temporary import entry (TIE) for visiting vessels. This legislative addition enables superyachts to stay in New Zealand for a period of up two years and undertake a mixture of private use, charter work and maintenance, most of which will be exempt from the local 15 per cent Goods and Services tax. 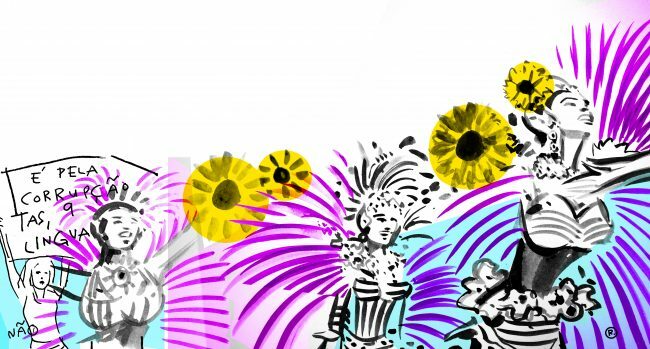 Palazzo Pitti special exhibition 2016. Karl Lagerfeld Photos. On the occasion of Pitti Immagine Uomo 90, on June 14 in Florence, Palazzo Pitti hosted “KARL LAGERFELD – Visions of Fashion”, a photography exhibition curated by Eric Pfrunder and Gerhard Steidl, which represents Karl Lagerfeld’s entire photographic oeuvre and includes many unpublished works. The exhibition – that will be on show until October 23rd – is made possible thanks to the recent agreement of collaboration with the Gallerie degli Uffizi signed by the Fondazione Pitti Immagine Discovery, with the support of Centro di Firenze per la Moda Italiana and Pitti Immagine. As to the Sala Bianca, where Italian fashion was born in 1951, the curators have selected fashion photos by Karl Lagerfeld printed on lightweight paper that will flutter from the ceiling, recalling the lithe movements of models on the runway.In the 1960s/1970s Italy’s emerging ready to wear was shown at the Pitti Palace Fashion shows, with dinner afterwards at Sabatinos……. “KARL LAGERFELD – Visions of Fashion” is part of the “Special Program for the 2016 Pitti Immagine Fairs”, promoted by the Centro di Firenze per la Moda Italiana with a grant from the Ministero dell Sviluppo Economico – Ministry for Economic Development and Agenzia ICE – in support of Italian trade fairs and Made in Italy. Courtesy and with thanks. Italy as a Panorama in Vanderbilt Hall, Grand Central Terminal, New York City. 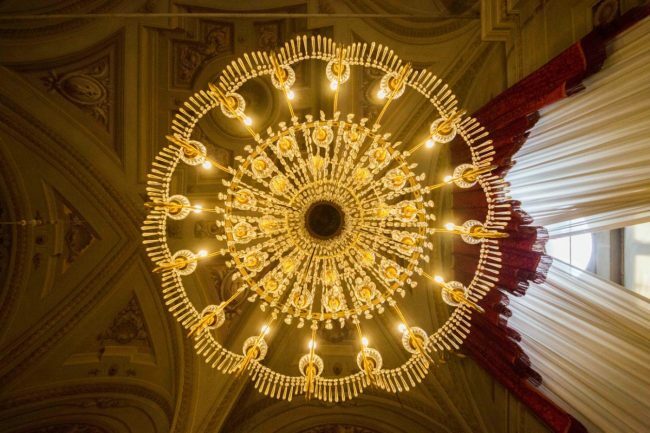 Courtesy of Fondazione Altagamma & its participating companies. 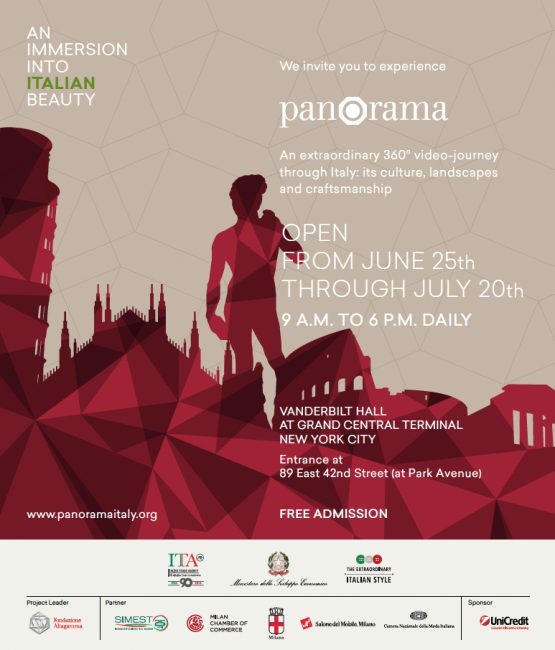 More than 16.000 New Yorkers and tourists alike have had the opportunity to experience Italy and immerse themselves in Italian beauty without ever leaving the U.S, from June 25th through July 27th. The Ministry of Economic Development, the Italian Trade Agency, and the Altagamma Foundation brought Italy to New York City’s iconic Grand Central Terminal with an extraordinary 360° panoramic video installation – PANORAMA – that takes guests on a journey through Italy’s culture, landscapes, and craftsmanship. Panorama was brought to life by a pool of public institutions and private associations including also SIMEST, the National Chamber for Italian Fashion, Salone del Mobile.Milano, the Chamber of Commerce of Milan, and the Municipality of Milan.